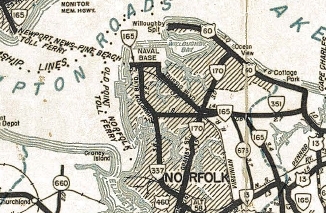 Creation: VA 351 was created In June 1944 (based on an item in the Jan 1945 CTB), as a renumbering of part of VA 168, plus new primary routing west of King St all the way to US 60. It ran more or less the way it does now. This is the 3rd VA 351. Although the 2009 traffic log still has VA 351 ending a block east of VA 169 Mallory, a VA 351 END shield was moved to Mallory between 2003-2007, then no END posting at all after that. Posted: Fully posted although poorly posted in Buckroe Beach itself. Truck route: A VA 351 TRUCK used to be signed in Hampton, following King St, Settlers Landing Rd, and Woodland Rd, presumably to keep trucks off the Pembroke Ave bridge over Hampton Creek. As of July 2005, only the trailblazer on US 258 SB remained of this TRUCK route which was no longer posted by 2007. 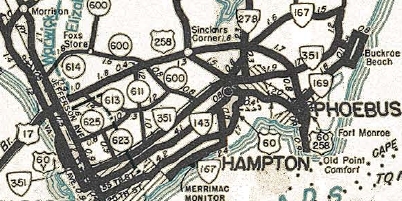 Comment: VA 351 does not connect directly to US 60 WB split, VA 143 or I-664 (although there are signs on how to make the connection from 60 WB and 143). It is also blown off completely by I-64. 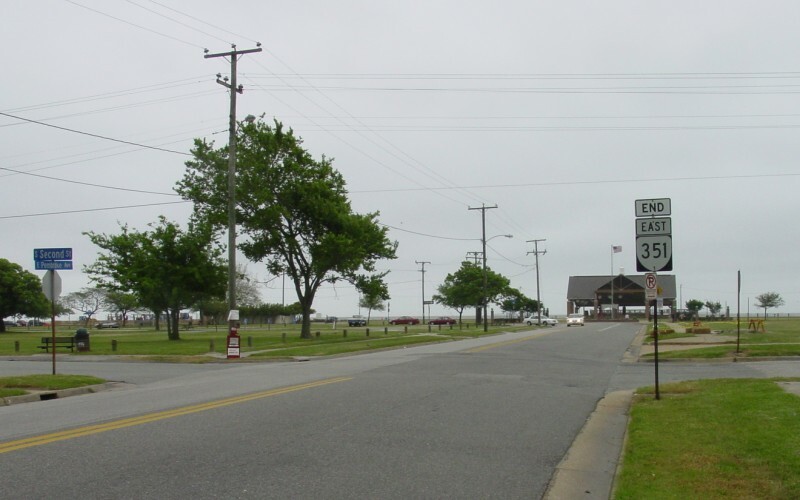 VA 351 #1: Created March 1924 (CTB) as new primary routing running from VA 35 south to Sussex CH. 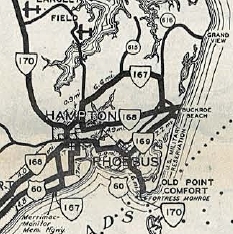 In Jan 1925 (CTB), VA 351 was extended southeast with VA 35 to Homeville, then extended east as new routing to Waverly. In May 1926, VA 351 was assigned to a route from Wakefield to Dendron, then quickly renumbered as part of VA 392. 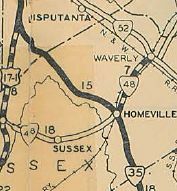 In Aug 1928, VA 351 was decommisioned as a state route from Sussex CH north to VA 35 (now SR 628); dropped from its VA 35 duplex; renumbered as part of VA 48 from Homeville to Waverly (now partly SR 634 and partly VA 40). VA 351 #2: Created in March 1942 (CTB) as new primary routing, running along Little Creek Rd from VA 170 (now US 460) east to US 60. This was an upgrade to some of SR 673, some of SR 600 and all of SR 669. In June 1944, VA 351 was renumbered as part of VA 168. Today it is a little VA 165 and all of VA 170.